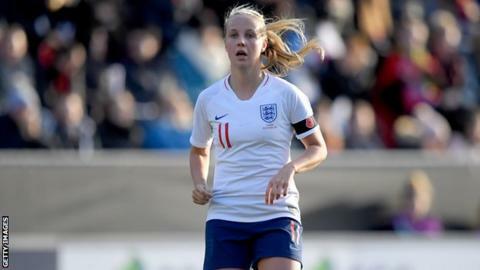 Arsenal forward Beth Mead has withdrawn from England's squad for their warm-weather training camp in Qatar. The 23-year-old suffered a knee injury in Sunday's Women's Super League defeat by Chelsea. Manchester City striker Melissa Lawley has joined the 28-player squad for the eight-day camp. BBC Sport understands the camp has been planned partly to learn more about what players and fans can expect if England reach 2022's men's World Cup in Qatar. The Lionesses will use the camp to prepare for the SheBelieves Cup tournament in the United States, which starts on 27 February, and this summer's Women's World Cup in France. Goalkeepers: Karen Bardsley (Man City), Mary Earps (Wolfsburg), Ellie Roebuck (Man City), Carly Telford (Chelsea). Defenders: Hannah Blundell (Chelsea), Millie Bright (Chelsea), Lucy Bronze (Lyon), Rachel Daly (Houston Dash), Gabby George (Everton), Alex Greenwood (Man Utd), Steph Houghton (Man City), Abbie McManus (Man City), Demi Stokes (Man City), Leah Williamson (Arsenal). Midfielders: Karen Carney (Chelsea), Izzy Christiansen (Lyon), Fran Kirby (Chelsea), Jade Moore (Reading), Jill Scott (Man City), Lucy Staniforth (Birmingham City), Georgia Stanway (Man City), Keira Walsh (Man City). Forwards: Toni Duggan (Barcelona), Melissa Lawley (Man City), Nikita Parris (Man City), Jodie Taylor (Seattle Reign), Chioma Ubogagu (Orlando Pride, on loan at Brisbane Roar), Ellen White (Birmingham City).